As coordinator of the Research Unit FOR2289 funded by the German Research Foundation since January 2016 (speaker: Ricarda Diem), the Neuroinflammation and –degeneration group is strongly linked to the Heidelberg Insitutes for Neurobiology (Hilmar Bading), Physiology (Andreas Draguhn) and Pharmacology (Marc Freichel). On a national level, FOR 2289 involves researchers of the Medical Faculties of the Universities Saarland, Münster, and the INIMS Hamburg-Eppendorf integrating the fields of anatomy, biophysics, neurobiology, pharmacology, physiology as well as experimental and clinical neurology and neuroimmunology. The consortium aims at elucidating principle calcium-related disease mechanisms of multiple sclerosis (MS) to develop cutting-edge methodologies (e.g. novel imaging techniques) and to identify new therapeutic targets. The anticipated synergistic outcome will have a profound impact on the understanding of acquired channelopathies, disturbances of calcium signaling and energy imbalance under neuroinflammatory and neurodegenerative conditions. The consortium is focused on as yet underestimated aspects of MS pathophysiology and applies a highly interdisciplinary approach. On a clinical level, tight collaborations exist with the German Optic Neuritis Network (coordinator: Ricarda Diem) including 13 German University Clinics and the Heidelberg Departments of Neurology and Opthalmology. This network is dedicated to effectively performing IITs in the field of neuroprotection in optic neuritis and MS. The Neuroinflammation and –degeneration group is also a member of the program “My lab: from bench to bedside” of the Gemeinnützige Hertie-Stiftung and closely interacts with other groups in this program which concentrate on translational neuroscience. The work of the Neuroinflammation and –degeneration group is focused on mechanisms of neurodegeneration in optic neuritis and MS (Meyer J Neurosci 2001; Hobom Brain Pathol 2004; Boretius Neuroimage 2008; Gadjanski Ann Neurol 2009; Williams Am J Pathol 2011; Fairless J Neurosci 2012; Davies Ann Neurol 2013; Sühs J Neuropathol Exp Neurol 2014) and the development of neuroprotective therapies, thereby covering the spectrum from animal studies to investigator-initiated clinical phase II and phase III trials in patients (Diem J Neurosci 2003; Sättler Cell Death Differ 2004; Diem Brain 2005; Sühs Ann Neurol. 2012; Diem BMJ 2016). Recently, we investigated the time course of neurodegeneration in rodent models of MS. 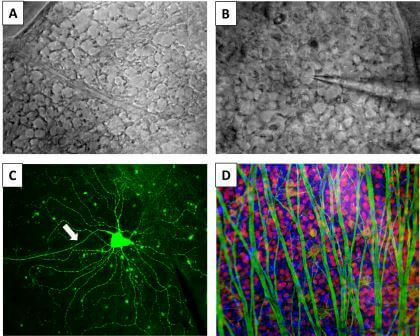 In these studies, we showed that degeneration of retinal ganglion cells (RGCs), the neurons whose axons form the optic nerve, is an early event preceding the onset of clinical disease and occurring prior to inflammation and demyelination of the optic nerve. In addition, we found that RGC bodies are lost prior to their axons which, at the time of significant RGC loss, still appear in full numbers, however, with signs of degeneration detectable at the ultrastructural level (Fairless J Neurosci 2012). These findings might indicate that the cause/trigger of RGC degeneration appears to develop in the retina, and is not secondary to optic nerve injury, as it is believed to occur during the clinical phase of MS. Studying the underlying mechanisms, we found that pre-clinical retinal neurodegeneration in MS is a calcium-dependent process (Gadjanski Ann Neurol 2009; Sühs J Neuropathol Exp Neurol 2014; Fairless Cell Tiss Res 2014). With respect to therapy development, we cover a methods spectrum from cellular imaging to neuroprotection studies within the frame of phase II and III clinical drug development. In a bench-to-bedside project, we identified changes in neurotrophin-dependent signaling in RGCs in animal models of optic neuritis. Erythropoietin, which re-balanced the affected pro- and anti-apoptotic signal pathways, led to improved RGC survival (Sättler Cell Death Differ 2004). In addition, we detected an improvement of visual function in rats with optic neuritis treated with erythropoietin in combination with methylprednisolone (Diem Brain 2015). Based on these results, we conducted a placebo-controlled, randomized, double-blind phase II clinical trial (VISION PROTECT; NCT00355095 randomizing 40 patients either to erythropoietin or placebo given as an add-on therapy to methylprednisolone. Erythropoietin was applied intravenously as an acute treatment in a high dosage over three consecutive days. Sixteen weeks after start of the disease, erythropoietin-treated patients showed RGC protection as concluded from significantly higher mean retinal nerve fiber layer thickness as assessed by optical coherence tomography and less atrophy of the optic nerve as measured by MRI (Sühs Ann Neurol 2012). Based on the positive results of this phase II trial, we started a phase III study with inclusion of a large spectrum of functional outcome parameter of vision (TONE; NCT01962571; Diem BMJ 2016). In this BMBF-funded 13-centres study, we have already included 73 of the planned 100 patients (status August 24th, 2016). Future work will focus on characterization, development and exploration of new therapeutic targets for neuroprotective therapies in MS. Our special expertise consists in translating basic research findings into clinical trials. Based on our work done during the past years, we aim to establish one of our candidate substances, which went through all steps of pre-clinical and clinical testings, as a clinical routine treatment in the near future. Retinal flatmounts. (A) Example image of a retinal flatmount, with the upper ganglion cell layer in view. (B) A patched RGC within the ganglion cell layer being recorded. (C) Fluorescent confocal image of an RGC post-recording, the cell was loaded with biocytin during recording and subsequently fixed and imaged using Alexa-488-conjugated streptavidin. The white arrow indicates the axon. (D) Identification of RGCs within the slice following recording is possible by labelling for RNA binding protein multiple slice (RBPMS, red), and alpha-RGCs by expression of non-phosphorylated neurofilaments (recognised by the SMI-32 anitbody, green).